Literacy InterActives, Inc. is a registered 501(c)(3) organization that promotes and advances the interactive learning and literacy of cultural history, education, and technology. Through interactive literacies, we bring diverse communities together as stakeholders in order to make a positive difference in today’s world. In 2007, nine Board of Directors launched the beginnings of Literacy InterActives, Inc. (LIA) in southern Virginia as a “new dimension of performance” that now extends into regional and national communities. “Interactive” defines the ways that diverse and inclusive “literacies” are needed, shared, advanced, and used in today’s world. In this sense of interactive learning, LIA sustains, advances, and applies reading and writing, computer skills and technology, K-12 education and beyond, in order to make a positive difference in our communities. LIA established its major program initiative that expresses interactive literacy through the intersections of public history, K-12 education, technology, and computer literacy: The historic preservation and rehabilitation of the Parker Sydnor historic log cabin site located in Mecklenburg County, Virginia. We are the proud sponsor of the Parker Sydnor historic log cabin project—an interactive historic preservation project of a 19th century log cabin built by enslaved African Americans in Mecklenburg County, Virginia. 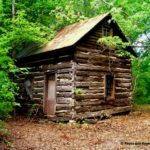 The Parker Sydnor historic log cabin site, sponsored by Literacy InterActives, Inc., a 501(c)(3), is an initiative that involves the preservation and rehabilitation of a 19th century log cabin built by enslaved African Americans in Mecklenburg County, Virginia. Listed on the National Register of Historic Places and the Virginia Landmarks Register, the Sydnor log cabin embodies critical elements of Civil War and civil rights history, as well as the impact of contemporary cultural, educational, and technological interaction within local, regional and national communities.